Sinharaja is a magical rain forest that spreads in both Sabaragamuwa and Southern provinces. The famous forest is popular worldwide and tourists from every corner of the world is attracted to the forest reserve throughout the year. The forest is designated as a UNESCO world heritage site and thus captures the attention of many tourists. The park is also considered as a major Biodiversity hotspot in Sri Lanka and is well known as a Biosphere reserve internationally. The name “Sinharaja” simply means “Lion’s Kingdom” and was believed to suit the wilderness that surrounds the forest. The natural rain forest reserve of Sinharaja spreads over an area of 88.64 square kilometres. Though the forest was established originally in April 1978, it was designated as the UNESCO world heritage site in 1988. Sinharaja, dwelling in the lowland eco region of Sri Lanka is naturally a hilly rainforest. The park is easily accessible from any direction. The distance of the park is 21 km from east to west while the distance is just 7 km from north to west. The park is home to many wild life species. The treasured rain forest of Sinharaja provides shelter to many endemic species as trees, various types of reptiles, mammals, amphibians and varieties of birds. Even though there are many varieties of species, only a few from each is seen. Unlike in Yala, Minneriya or Udawalawe, the park is considered as a dry zone national park and thus rarely gets to see certain mammals as Elephants, Leopards and purple faced Langurs. The birds however, are seen abundant. Out of the 26 varieties of endemic birds, 20 are seen abundant at the rain forest. The interesting thing about the birds in the park is that they tend to fly in mixed feeding flocks and never mind about it. This charming quality only occurs at Sinharaja. Some of the most seen bird varieties include, Sri Lankan Blue Magpie, Green-billed Coucal and Red-faced Malkoha. 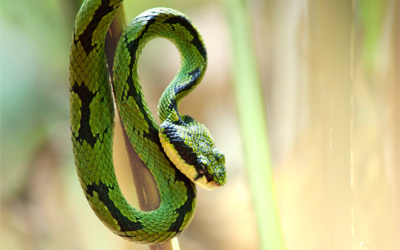 The most commonly captured reptiles include the endemic Green Pit Viper and Humped-nosed Vipers. Tree frogs are most sighted at the park throughout as well as the bird wing butterfly and leeches. The forest of Sinharaja could fall under the categories of both tropical lowland or tropical wet evergreen forests and that acts as a unique quality of this rain forest. The diversity of various species, tall and straight trees in nature and the loftiness of the trees all add up to the unique characteristics of the forest. Another spoken quality of the trees of the forest is that the forest type is highly prone to endemism. Some varieties of trees as Dipterocarpaceae shows a 90% of endemism. Majority of the tree heights vary between 35M to 40M where as some individuals rise even up to 50M in height. Out of the 211 woody tree varieties, 139 varieties which is almost 66% from the total varieties are reportedly endemic plants and low plants as ferns and epiphytes contribute to this endemism. Out of the total vegetation at Sinharaja forest, varieties as trees, shrubs, herbs and seedling are quite often visible and reportedly spreads about 240,000 individuals per hectare. As many are aware, Sinharaja is home to many endemic and other species of fauna. It has been reported that out of the 384 bird varieties in Sri Lanka, 282 varieties are easily visible in Sinharaja and include species as butterflies, amphibians, reptiles, fishes and mammals. Rainforest vegetation, Common Birdwing, water streams that flow across the forest, waterfalls in the forest and high tree canopies are some commonly visible attractions in the Sinharaja forest. As you experience a set of mixed attractions at the forest, you will understand that your tour to Sinharaja is like no other. The cold climate at Sinharaja would encourage you to enjoy the night with bonfires and BBQ. Your tour engages is many activities depending on your stay. Settle down in your accommodation provided feeling contented. Accommodation could be arranged in a campsite amidst of the forest wilderness or at a hotel nearby based on your preference. Prepare your cameras to capture an eye catching environment as well as many attractions of interest. Let this tour to Sinharaja be the one to make your memories of Sri Lanka even more wonderful and have a heart to return.